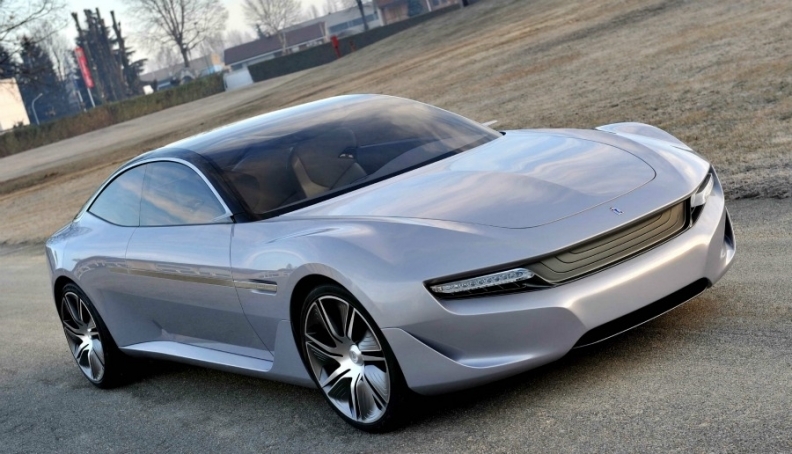 If Pininfarina builds 10 units of the Cambiano, each would retail for about 1 million euros. GENEVA -- Pininfarina may build a limited run of its Cambiano plug-in hybrid coupe concept unveiled at the Geneva auto show last week. The 680-hp model has a 275kph top speed but offers CO2 emissions of just 45 grams per kilometer. "We are evaluating the potential for companies and private buyers interested is a high-performance, low-emission luxury model such as the Cambiano," Pininfarina CEO Silvio Angori told Automotive News Europe on the sidelines of the show. The CEO said that if Pininfarina built 10 units, each Cambiano would cost about 1 million euros. If the production run were increased to 70 to 75, the per-unit price would fall to 400,000 euros, Angori said. He said it would take 24 to 30 months to start production of the Cambiano, which would probably have a diesel-powered internal combustion engine as a range extender rather than the diesel-fueled turbine in the concept. Each wheel on the Cambiano concept has an electric motor that delivers 60kW as well as peaks of 150kW for short periods. Maximum output is limited by the battery capacity to 500kW, equivalent to 680 hp. Pininfarina says the concept has an 800km range, including 205km in full-electric mode, and can accelerate from 0 to 100kph in 4.2 seconds. The Cambiano is named after Pininfarina's home city near Turin.